Lots of layers is a good start; but there’s much more to keeping them comfortable. 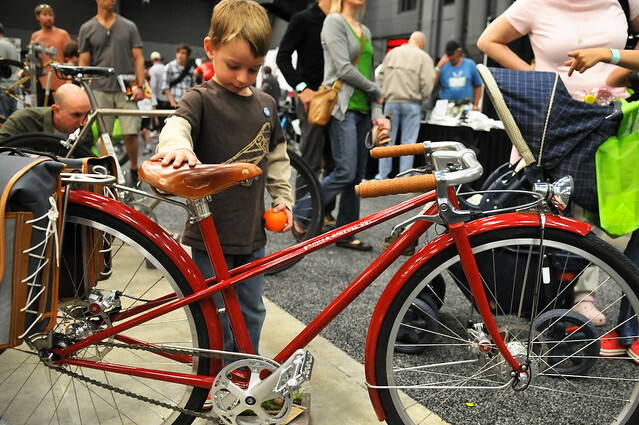 You’ve decided to start biking more with your little ones. You’ve found routes that work for you. You’ve got your bike set-up figured out. And then you look outside and realize it’s 35 degrees. Pedaling my heavy bike keeps me warm, but it’s a different story for my non-pedaling passengers. They need at least one extra layer when it’s cold outside. That’s one of the many things I’ve learned over the years. 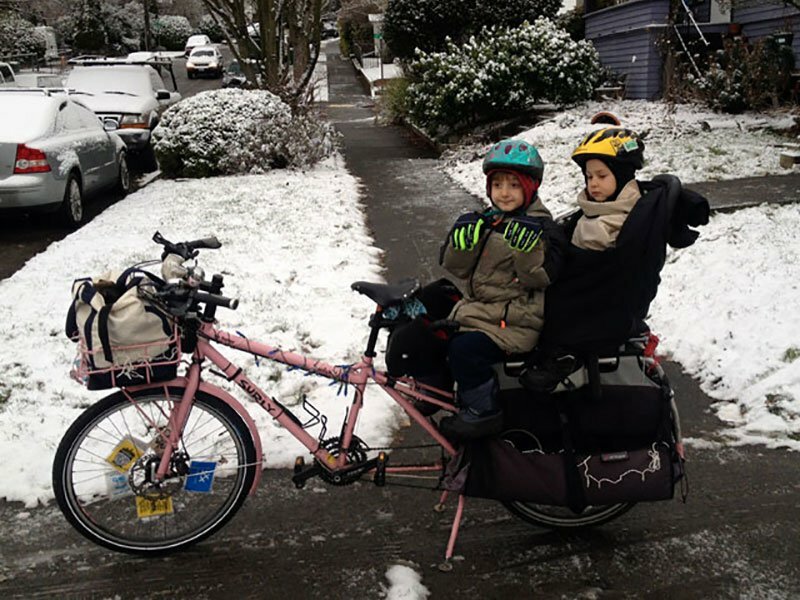 As we get our first major snow storm of the year, this week’s post is all about how to stay warm and dry while biking with kids. First, I’ll go over the things you can put on your bike, then I’ll share the things you can (hopefully) put on your kids. When a kid has the confidence to do little tricks, it’s a good sign they trust their bike. When he was finally ready, his bike was more than up to the task. That’s how I think about my five-year-old son Everett’s evolution to becoming a confident bike rider. It wasn’t easy. 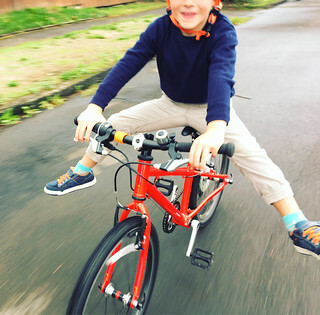 He first learned to ride a regular pedal-bike (after learning on a balance bike) over two years ago. But for some reason he didn’t keep it up. He parked the bike and seemed afraid or nervous about it whenever we urged him to get back on the saddle. Even getting a shiny new red bike didn’t inspire him! I was completely at a loss. I was so frustrated that I just stepped back and stopped even talking about riding (absent dropping a few hints here and there). Then one day while I was out of town, I got a text from Juli. It was a video of Everett riding his bike. “This just happened,” she wrote. He got his bike out and just started riding it. All on his own. I guess he was finally ready. And thankfully, his bike was too. It’ll be an introduction to transportation careers. If you’re a female high schooler with a yen for understanding how cities work and how to help them evolve, Portland State Unviersity has a deal for you. 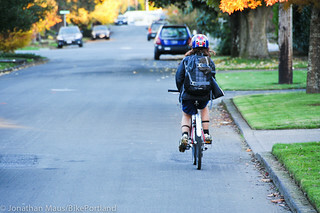 Portland pupils keep riding cars to school less, and walking and biking more. Survey data released by the city Wednesday show a continuing upward climb in active transportation to school. Among Portlanders in kindergarten through fifth grade, walking, biking and otherwise rolling to school became more common than traveling in the family vehicle sometime around 2010 and has more or less kept climbing since. 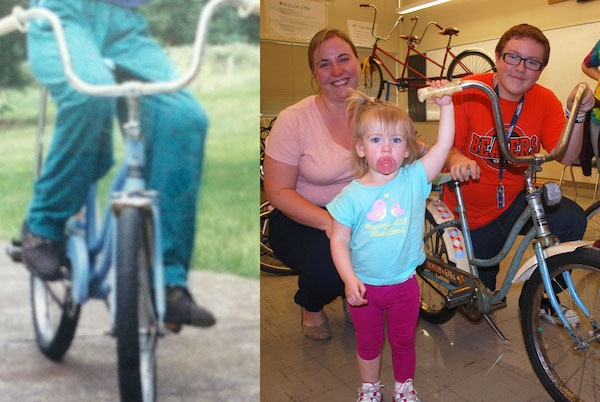 A Hillsboro woman will get a chance to pass her childhood bicycle on to her daughter after a chance reunion made possible by Poynter Middle School’s bike club. Hillsboro School District posted the one-chance-in-10,000 story on its website Monday. Portland is, thankfully, a relatively safe city to get around. Even the United States in general, with our 30,000 road deaths every year, is full of hundreds of millions of people who aren’t getting physically hurt. 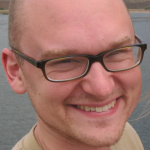 But the real cost of Vision 30,000 (as I saw a local transportation planner put it the other day) isn’t broken bodies. And it doesn’t have anything to do with biking in particular. It’s the fact that almost all of us spend our entire lives in a constant, low-level fear of losing our daughter, our son, our spouse, our best friend, to traffic. How does that perfectly reasonable fear shape our lives? How does it lead us to shape theirs? As someone who didn’t really come to appreciate biking until I was in high school, my mind is sometimes blown by thinking about people born into biking life here in modern Portland. A comment Wednesday morning from BikePortland reader Katherine, beneath Jonathan’s ride-along with a dad and his four-year-old daughter, conveys it better than I ever could. Two plug-in electric bikes donated this month to Southeast Portland’s Glencoe Elementary will introduce students to the concept of pedal-powered energy. From Portland’s first Kidical Mass in 2008. 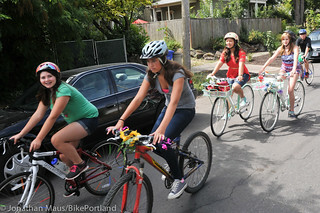 Kidical Mass PDX, the tradition of family bike rides each month exploring neighborhoods around Portland, will hold its annual planning meeting one week from Saturday and is inviting anyone who might have ideas to join in. 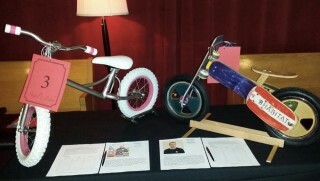 Balance bikes for bid. See more photos below. 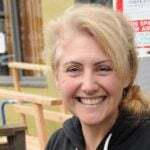 From the Bike Mechanic Challenge back in June to their successful Transportation Trivia Nights, the northeast Portland based Community Cycling Center has a knack for dreaming up great ways to support their cause. But this one might take the cake. In the spirit of the season when little kids dream of their first bike, the CCC challenged five of its staffers to compete in a “Balance Bike Build-Off”. For the uninitiated, a balance bike is a tiny bike for toddlers without pedals or gears and a seat so low it can be powered by running instead of pedaling. They’re simply the best way to learn to how to balance, and ultimately ride, a bike.